Viking 61 Sport fish is best known for sport fishing luxury and performance because of its lean and muscular outside, lavish interior, massive cockpit and superb open-water handling. Like all other Viking models, the high gloss woodwork and rich décor makes the 61 interior space truly elegant. 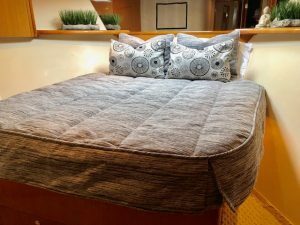 We did mattresses and bedding for this Viking 61 client. As the images show, we have used our quilted coverlets in Beach Dusk fabric throughout. One of my favorite house fabrics with the perfect shades of greys and amazing texture. The customer wanted a casual yet modern look. The designer specifically used this fabric because of its masculine feel and crisp modern touch. 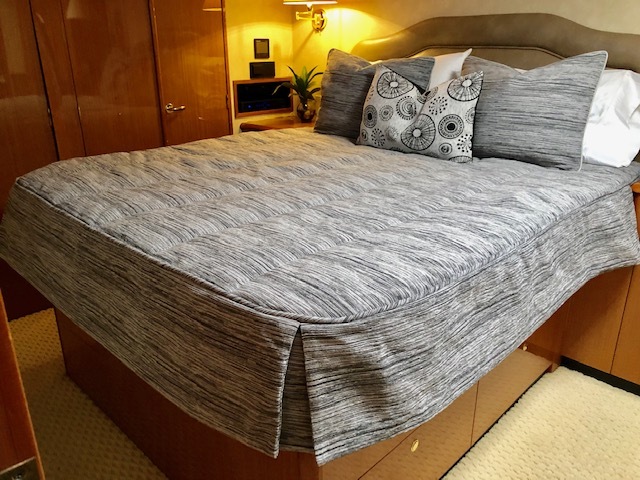 Our quilted coverlets are perfect for keeping your stateroom looking tidy and are a breeze while making the bed. Our coverlets fit the size of your bed, are quilted with a medium weight batting, have a piping trim edge and a drop to give a beautiful custom look. We have various styles when it comes to bedding. Aside from quilted coverlets, you can mix and match our fabrics to design custom duvets or silken coverlets for your bed too. Browse our website to view our entire collection of coverlets, duvets and blankets. I always like to mention that we make everything custom to fit the size and shape of your particular bed. You can view our fabrics online and let us know your top picks and we will be happy to send swatches your way. We also have the Sunbrella Farbrics and carry the fine line of Sferra Collection too. Feel free to contact us and our design team will be happy to help you with your inquiries. When it comes to mattresses and toppers, we can make any shape and material you prefer but we always recommend Latex to our customers. The reason is Latex being mold and mildew resistant, extremely comfortable, helps regulate body heat, which allows you to sleep cooler than warmer and it is bendable and breathable. Our most popular Latex mattress is our 7” Commodore. Constructed with a 6″ Latex core and covered in an ultra-soft bamboo quilting, this mattress is all about comfort. If you love a plush mattress, then I recommend to look into our 9” Admiral. Constructed with a super comfy 6” (medium) Latex core. We then add 2” of ultra-soft latex Pillow Top and cover it in the plushest of bamboo quilting. The result is one amazing plush mattress. Each boat mattress we make is crafted custom in California and built to stand up to rigors of a marine environment. 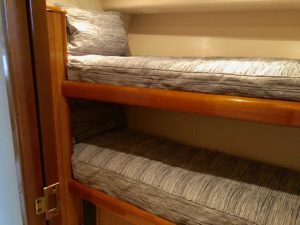 Our goal at Yachtbedding.com is to make the process simpler for our clients and help transform their stateroom into a STATEMENT ROOM.